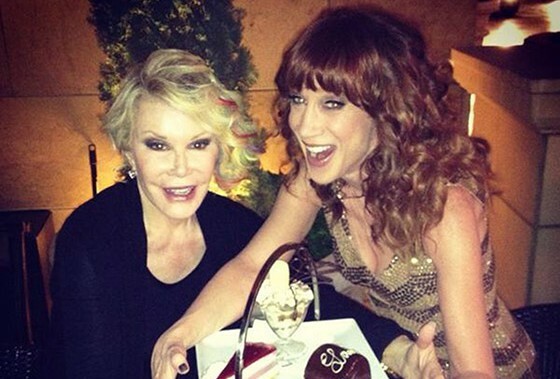 There have been hints and clues for months but now it’s finally official: comedian and gay icon Kathy Griffin is going to fill Joan Rivers’ bedazzled shoes as the new captain of E!’s Fashion Police. Kathy will kick off the new seasons coming January 12 with a Golden Globes special. But hold on, that’s not all: there is more change on the way. George Kotsiopoulos, a.k.a. adorable Georgie, won’t be retuning to the show! Why, oh why?! We can only guess since neither George nor E! have offered a reason. The stylist of the stars will be replaced by another male fashionista: Brad Goreski, star of It’s A Brad Brad World. While we’ll miss Georgie, Brad is definitely easy on the eyes. So, no complaints here. Before you start bawling because you can’t handle too much change, some things are going to stay the same. Luckily, veterans Kelly Osbourne and Giuliana Rancic will be back in their chairs coming January as the trusted faces of Fashion Police. All in all, Kathy is probably the best choice out there for the gig. While not necessarily a fashionista like the late Joan, being fearlessly funny, she is best equipped to continue the successful series. Plus, as a good friend of Rivers, she undoubtedly has approval from above. I get it! These are some big shoes I’m going to fill. Joan was truly one of a kind. Now I hope you will accept me for me. I’m just Kathy. Did I say I’m just Kathy? I meant I’m Kathy F***ing Griffin and you celebrities better strap yourself in, as I am taking no prisoners. I am not holding back so DAMMIT let’s have some fun!